This article was written on 12 Sep 2015, and is filled under Author: dew. M. Night Shyamalan is a fairly polarizing filmmaker. After the groundbreaking twist ending to his 1999 film The Sixth Sense, his films have nearly all tried to recreate the shocking finale that made him famous, and without much success. 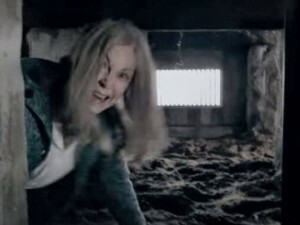 The Visit is the latest entry in this string of films attempting to frighten viewers and play with their minds. The film’s stars are two relative newcomers, child actors Olivia DeJonge and Ed Oxenbould, who star as siblings Becca and Tyler, who are off to spend the week with the estranged parents of their mother (Kathryn Hahn), meeting them for the first time. Becca is an aspiring filmmaker intent on creating a documentary that she hopes will heal her mother’s long broken relationship with her parents. The girl’s impulse to be behind the lens is what brings about the format of the film itself: brace yourself, folks – it’s found-footage. Years before Becca and her wannabe preteen rapper brother were born, their mother ran off with a substitute teacher from her high school – their eventual father – causing a schism in the family created by a confrontation, the events of which Becca’s mother refuses to reveal. The teacher eventually ran off and left her with the children, and it seems that the mother sees some hope for mending her fractured family when her parents, who run a counseling website and volunteer at a local hospital, contact her via email and arrange for the visit. The story takes place predominantly at the grandparents’ rural Pennsylvania farm, with the two kids enjoying the time with their newfound elderly grandparents, Nana and Pop Pop, played by Deanna Dunagan and Peter McRobbie. In spite of the picturesque farmhouse setting and the sweet-as-pie behavior of Nana and Pop Pop, these begin to get strange very quickly. The grandparents begin to exhibit odd behavior, causing concern for the children who are constantly reminded by their reassuring mother, via video chat, and also the grandparents themselves, that they are getting on in years and have idiosyncrasies that the kids may never have been exposed to before. It takes five days before the truth comes out, leading to that famous twist we’ve all been waiting for. The film, sadly, is another mediocre turnout for Shyamalan, though admittedly better than The Village, The Happening, and The Last Airbender (the not so surprise twist to that film being all of the characters of varying ethnicities were shockingly played by white people). The pacing is well set, with the strange behavior of the grandparents slowly seeping into their routine and a good grounding in foreshadowing laid down early on; the backstory for the children themselves, with their own strange behavior and its root cause in their paternal abandonment, was a good counter to the off-the-wall and oftentimes creepy actions of their grandparents. You really need to be filming this, Becca? Like most found footage films, there are many moments where it seems improbable that any character would still be gripping a camera while fighting for their lives. What became a pivotal bit of information in the film’s climax, Tyler’s childhood memory, seemed maudlin and forced. Beyond that, the climax itself was extremely overdone. Sadly, it was the over-the-top happenings after the big reveal came about that ruined the film, making what could have been a good subtle thriller become a complete caricature of what it could have been. Want to know the twist? If not, cover your eyes folks, cos here there be spoilers! Gonna ruin the ending for you. Turn back now if you want to live! The twist of the film is predicated on the fact that the kids make the journey to meet their grandparents via train, alone; Becca and Tyler agreed to the trip so that their mother could take a cruise with her boyfriend, Miguel, who Becca knows loves her mother. They want to give her mother a chance to be happy; giving her time alone, and perhaps easing the way into a reconciliation with her parents. When Nana accidentally mars the webcam on Becca’s laptop, the kids aren’t terribly concerned and manage to fix it in a day or so, not alerting their grandparents to the change; it seems inconsequential at the time, but later comes into play. After Becca witnesses Pop Pop fiddling with a shotgun and Tyler gets video of Nana scampering around the house with a butcher knife, they get in touch with their mother, who has arrived home from the cruise. Trying to convince her it is dangerous and they need to leave, they turn the laptop to the window to show their mother how strange the grandparents are acting outside… only to find out that the Nana and Pop Pop they’ve been sharing the house with for days aren’t their grandparents at all. It is revealed later that night that the hospital the real grandparents volunteered at was a local mental institution, and they have been murdered and replaced by two escaped patients, a man who hallucinated a white creature with yellow eyes chasing him down and a woman who had apparently drowned her own two young children decades prior. 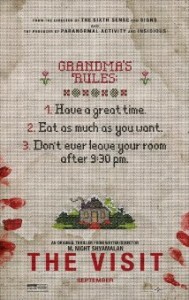 The last twenty minutes of the scene are comprised of the kids trying to escape the faux-grandparents, who have gone completely off the deep end – which in itself is the major problem of the film. Insanity is frightening in and of itself. Couple that with escapees from an institution with known violent pasts, and it is a good recipe for a thriller. Faux-Nana’s dissolving sanity is done well, fading a little by each day until she is frightening and manic. Faux-Pop Pop, however, loses his mind with the flip of a switch of sorts that seems both unlikely and poorly drawn. Beyond that, a shared delusion between the two – about aliens with a strange relationship with water, imagine that – is unlikely and, let’s be honest, dumb. This could have been a good film. This could have been frightening: children trapped on a snowy farm, far from anyone who could help them, with imposter-grandparents escaped from a mental institution who have murderous intentions? That could be scary. But when they begin babbling about aliens and dirty adult diapers create awkward (and gross) laughs, it was just too much. You were so close, man. So close to a good film. Maybe next time?